Andre Mendes, ThoroughTec Simulation, South Africa, explains how underground bolter simulators can improve operator safety and efficiency. 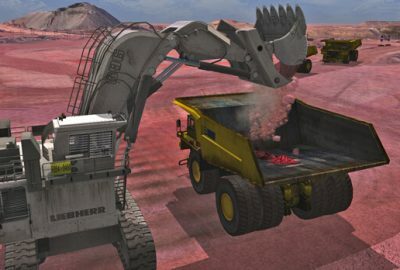 The company’s CYBERMINE range of products is well established as the undisputed market leader in the complex and demanding field of underground mining equipment simulation and includes an unmatched range of bolters from all the major international underground OEMs. “The latest generation CYBERMINE simulators are designed to efficiently deliver real, measurable improvement of operator safety and productivity in high risk mining operations”, says Richard Bellengère, head of operations at ThoroughTec. 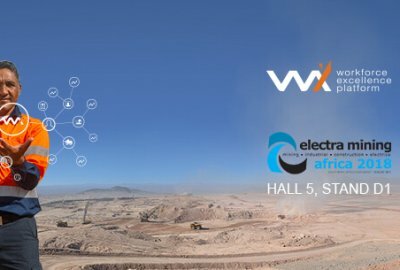 Over the years, the company has worked with a diverse range of mining OEMs and clients from around the world and across the spectrum of operational techniques, to deliver the most comprehensive and effective bolter simulators available. These high-fidelity simulators are designed to operate like the real vehicle, but at a fraction of the cost and without any of the risk associated with traditional practical training methods. “As with all of our CYBERMINE products, the goal is to develop an inherently safe, high-functioning and productive workforce, thereby optimising the mine’s sustainability and profitability,” says CEO, Justin Collins. 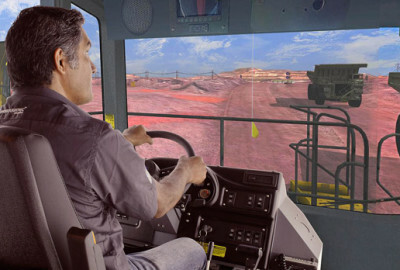 Operators are immersed in an ultra-realistic, 3D virtual mine world and operate the simulators from within a fully replicated control cabin built around actual OEM controls. According to ThoroughTec, a Zimbabwean mine reported a 41% improvement in the average time taken per bolt installed. The mine has four CYBERMINE simulators, with one of them dedicated to the training of Sandvik DS210L-V bolter operators. The site also noted marked improvements in the averages of position, pitch and yaw error. “This same mine reported an average 147% improvement in number of bolts placed when comparing their first and last training session,” notes Bellengère. The average number of bolts per operator went up significantly. Unlike other production equipment, bolters are procedurally complex pieces of equipment that require operators to follow a lengthy sequence of events to ensure bolts and mesh (if applicable) are correctly placed and inserted, without damaging the equipment. Taking shortcuts or failing to follow the right sequence can result in several failures such as the resin not setting and bolts dislodging or breaking, which in turn threatens the safety of all operators underground. A long-time user of CYBERMINE simulators is Assmang’s Black Rock operation in the Northern Cape, South Africa. Their newest simulator caters for the training of Atlas Copco 235 bolter operators. Black Rock boasts five CYBERMINE simulators across a range of underground equipment, including complex drill rigs, scalers, ADTs and LHDs. The 235 bolter simulator monitors functions include colliding the boom with the face, drilling without flushing and inserting the incorrect amount of resin, to name a few, and all of which will score the operators on their performance. Another South African operator of CYBERMINE bolter simulators is South32’s Khutala operation in Mpumalanga. They have two simulators for the training of Fletcher HDDR roof bolter operators, which is proving to be a vital cog in the mine’s operator training programme. According to the mine, simulation is fundamental in helping their Fletcher bolter operators to deal with unsafe roof conditions and apply the correct bolting patterns when actually on the job. “The operator will learn and become comfortable with how the machine’s controls work long before they ever using the real thing and as a result, they can confidently concentrate on safety and operating technique when confronted with the actual machine underground.” noted Bellengère. Before Khutala introduced simulators into their training programme, they were finding that some of their bolter operators were bolting without deploying the jacks. “This puts a lot of strain on the tyres, and consequently decreases their operational life,” says Bellengère. The simulators picked this issue up immediately and quickly corrected a simple yet costly behavioural issue. Moving farther afield CYBERMINE bolter simulators are finding favour in China as well. JCHX Mine Management, one of China’s leading underground contract miners, has invested in five CYBERMINE training simulators, all stationed at their advanced new training centre in Miyun County, just outside Beijing. Two of these latest-gen simulators are for bolter training, specifically for Sandvik DS411 and Atlas Copco Cabletec LC operators. Heading north another operation is seeing the benefits of putting their bolter operators through simulator training. The Oyu Tolgoi mine in Mongolia has four CYBERMINE simulators, with one of them assigned to the training of Atlas Copco Boltec MC operators. Over a range of training sessions the mine witnessed a notable reduction in the number of errors being committed. There was a 66% improvement in number of errors per hole as well as a 30% reduction in the time spent per hole. “These improvements result in the mine reaping the benefits of a more efficient and safer operator, which is paramount when working underground and lives depend on the quality of your work,” said Bellèngere. Labour and skills development are not just important issues in emerging markets but throughout the mining world, and ThoroughTec is on a mission to communicate its belief that workforce performance improvement is about more than just training; it’s about how people do their jobs every day, how they identify and learn from their mistakes and then do better tomorrow. 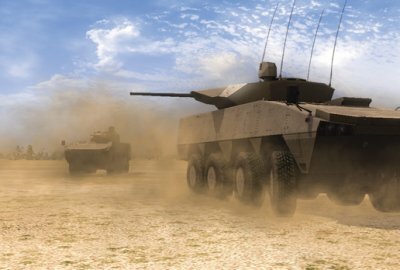 DEFENCE WEB – AUGUST 2017 Denel Land Systems has begun receiving high-fidelity training simulators for the South African Army’s new Badger Infantry Combat Vehicle (ICV). The SA Army is set to receive 244 Badgers in different variants over the next few years and from the outset, simulator based training has formed an essential component of its mission system.